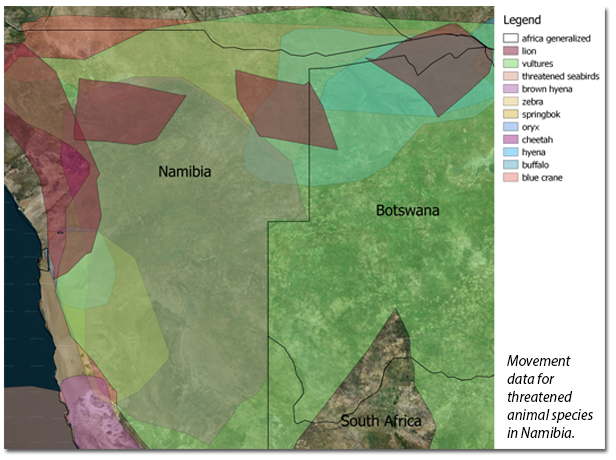 Since returning to academia, I have been struck by a particular disjuncture between the biodiversity sciences and IA practice in my country, Namibia. Having worked across Africa, my suspicion is that it probably applies to the entire continent, perhaps even broader. Allow me to expand. I had my wildlife scientist hat on a few weeks ago at a southern African symposium on wildlife tracking and telemetry science. This is the discipline where we put tracking devices with various sensors on wildlife and monitor them remotely. It was impressive to see the vast array of research (both spatially and temporally) on elephant, lion, leopard, cheetah, hyena, oryx, springbok, zebra, giraffe, crocodile, fish, penguin, flamingo, vultures, and even cattle. It was also clear to see the effects of human settlements, roads, pipelines, and fences on wildlife movements. Each project was addressing a narrow conservation objective, blissfully unaware of the others being conducted on the same species or even in the same general area. The symposium helped to at least broaden the scientific benefit of looking at all these projects as a whole. Bear in mind this is all current (sometimes up to the minute) biodiversity data… gold dust! This is only one tiny aspect of biodiversity science in southern Africa, where local and international scientists active in fields of botany, entomology, ecology, zoology, and human-wildlife interactions currently abound (just go to Google Scholar and search “biodiversity Africa since 2015”). Despite this, I often find EIA reports in the region bearing disclaimers that impacts on biodiversity were difficult to asses as a result of inadequate data on the extent and state of biodiversity in the affected environment. It is clearly not the case. So whose fault is it? Are the scientists not able to translate their findings into something useful for development planning? I am sure that somewhere in the opening paragraph of their research proposals they state that the reason for their research is to enable conservation of a species threatened by development, but do their results and outputs reflect solutions to this? Seemingly not. What about the IA practitioners? Are they not aware of the information? Do they not see its value? Seemingly not. To investigate this further I have put a Master’s student onto collecting biodiversity data sources from EIAs and SEAs and comparing these with scientific journal information and IUCN/WWF/WCN research information (he still needs a sponsor, by the way). So what to do about this disjuncture? I have a few ideas, but I would really like to hear from others in the IAIA family—perhaps this is something you have seen and addressed. Getting these scientists to write specialist reports as part of the EIA does help, but often the IA practitioners are not even aware of them as they live in a tent under a shade tree and dream of publishing five journal articles on the left eye muscle of the lesser-spotted toad. How can we bring the two worlds together more? No comments were found for The Curious Divide between Conservation Science and IA. Be the first to comment!